Some of our greatest innovations have been in the military field. These are the wacky weapons that misguided military inventors have come up with over the years. Today animal rights organizations would protest the use of animals in warfare but in World War II, several different nations did just that. The United States tried bats with tiny incendiary bombs because of the large number of bats available, their ability to carry more than their own weight and the fact that they find hiding places like buildings during the day. The British attempted using dead rats with plastic explosives inside. They thought that when the Germans would shovel them into the boilers with the coal they would explode. In the Soviet Union, anti-tank dogs were trained to think that food was stored under tanks and armored vehicles. Then they were laden with explosives and released onto the battlefield where they ran straight under the tank and were detonated – doing the most damage possible to the tank. The mastermind behind the bat bomb was dental surgeon Lytle S. Adams whose idea was approved by President Roosevelt in 1942. The exploding rats were one of the developments of Britain’s Special Operations Executive, an organization started in World War II to conduct warfare by means other than direct military engagement. But before the rats could be used, the first shipment was intercepted by the Germans and the Brits dropped the plan. The use of dogs for military purposes in the Soviet Union began in 1924 and a specialized training school was founded in the Moscow Oblast. A weapon of the Middle Ages, the sword breaker was a long sturdy dagger with notches cut on one side of the blade. During battle a knight would catch his opponent’s sword in one of the notches and with a quick twist would break the blade. It is unknown who came up with the idea for the sword breaker but it came into use in the Medieval Era, and was one of many tools in a knight’s arsenal. The man catcher is a type of pole weapon with two prongs, each of which is semicircular with a spring loaded trap on the front. It was designed as a means of pulling a person from horseback and played a major role in the Medieval custom of capturing royal or noble enemies for ransom. The man catcher was also used to trap and hold violent prisoners. No one knows who invented the man catcher but it came into use in Europe during the Medieval period and was used until the 18th century. The Edo era Japanese had a similar weapon called a sasumata which pinned an enemy to the ground or against a wall. A variation of the susamata is still used today by Japanese riot police. Often considered the first machine gun, the Puckle Gun or Defense gun was a tripod-mounted, single barrel flintlock gun with a multi shot revolving cylinder. It was designed for use on ships to prevent boarding and could fire 63 shots in seven minutes. But what makes this weapon weird and unique is that it was capable of firing two types of bullets, round bullets to be used against Christian enemies and square bullets to be used against Muslim Turks. The square bullets were thought to be more painful and according to the patent would convince the Turks of the benefits of Christian civilization. 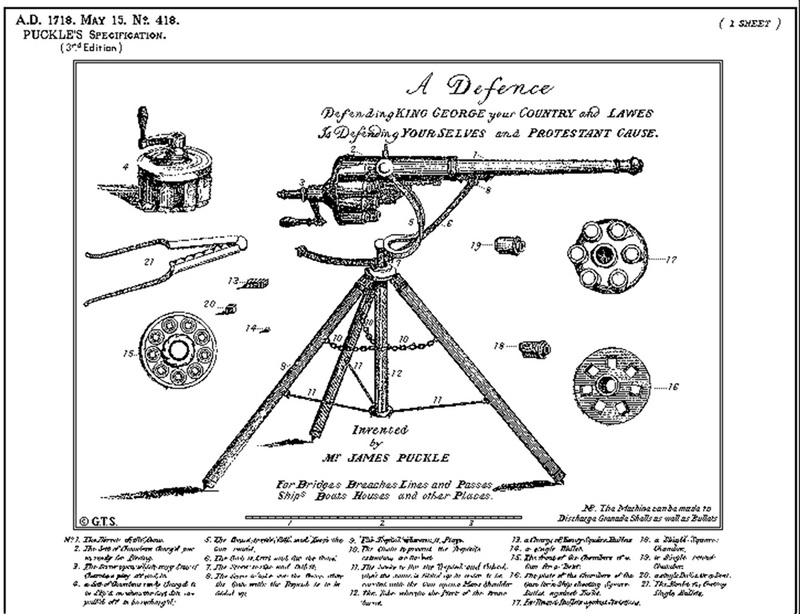 The Puckle Gun was invented by English inventor, lawyer and writer, James Puckle in 1718. The patent was one of the first patents to require a description of how it worked. Despite drawing a few investors the Puckle Gun was never widely produced as many gunsmiths couldn’t mass produce the complex components. Popularly included in many steam punk style novels, TV shows and movies, the flying aircraft carrier was briefly a part of the collective imagination of the wartime public. While most think of a zeppelin type ship with an airship on the top, after the Hindenberg disaster all plans to build these types of ships were scrapped. However, later attempts to transport fighters closer to the action include bombers and more recently, modified Boeing 747s. The Zeppelin carriers were developed by the US Navy in World War II using a system where a plane was equipped with a sky hook that would attach to a trapeze on the bottom of the ship. The bombers were first used by the Japanese on kamikaze missions in World War II. Later bomber and jet carriers were developed by NASA. A product of the Renaissance, the Lantern Shield was not only a defensive tool but a weapon in its own right. The Lantern Shield is a small buckler on which was an added gauntlet with serrated blades, a long blade parallel to the user’s arm, spikes and lantern attached to the center of the shield with a hook. The lanterns were covered with a leather flap and then were removed to confuse the attacker. But it wasn’t so much of a military weapon, it was used either by fencers or as protection from criminals while walking the city streets at night. It is unknown who invented the lantern shield but it came into use in 16th century Italy. It has been considered by some as a Swiss-army shield because it is a balance of defensive and attacking characteristics with a touch of psychological warfare thrown in for good measure. During World War II, metal was a precious commodity. Allied forces were losing a lot of supply ships to German U-boats. 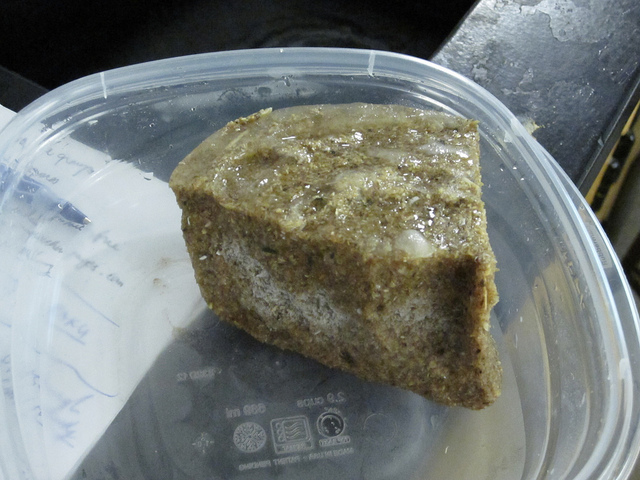 So the British government planned to build an aircraft carrier out of pykrete (a mixture of ice and wood pulp). After much research, they determined that the carrier would be 2000 feet long with a 40 ft thick hull which would be built with an extensive cooling system and would be capable of carrying 150 planes. The pykrete itself was made out of 14% wood pulp and 86% water which was more easily repaired than traditional metal ships. The pykrete carrier was invented by Geoffrey Pyke while he was working at Combined Operations Headquarters. Although before any ships were produced, the war had come to an end and there was no longer a need to create these ships. The Claw of Archimedes was designed in the third century AD to protect the Carthaginian stronghold of Syracuse from a Roman naval attack. It was a giant crane with large grappling hooks attached to it with ropes. When a Roman ship got close to the city walls, the hooks would grab onto the ship and lift it partly out of the water. Then the ship was dropped causing them to capsize. The machine was so effectively hidden that the Romans began to think they were fighting against the Gods. One of the greatest minds of his time, Archimedes was charged with the task of defending Syracuse by its ruler Heiro. The Claw of Archimedes became useful during the Second Punic War when Rome attacked Syracuse with more than 220 Quinqueremes. The Whirlwind Cannon was built in Germany during World War II to produce man-made whirlwinds. The machine worked by creating explosions in a combustion chamber and releasing them through nozzles at their targets. A smaller scale model was built and was capable of shattering planks 200 yards away. A full size Whirlwind Cannon was constructed but it was unable to produce whirlwinds at high altitudes and the project was scrapped. The Whirlwind Cannon was the brainchild of Dr. Zippermeyer, an Austrian inventor who built a number of odd anti-aircraft weapons out of an experimental establishment at Lofer in the Tyrol. During the war his work was closely watched by the German Office of Aeronautics as a way of protecting Germany from the overwhelming numbers of the Allied Air Forces. The halitosis bomb or gay bomb was a theoretical non-lethal bomb that when deployed would release strong female pheromones. The idea was that the aphrodisiac would make enemy soldiers irresistible to each other thus they would become distracted and easier to attack. 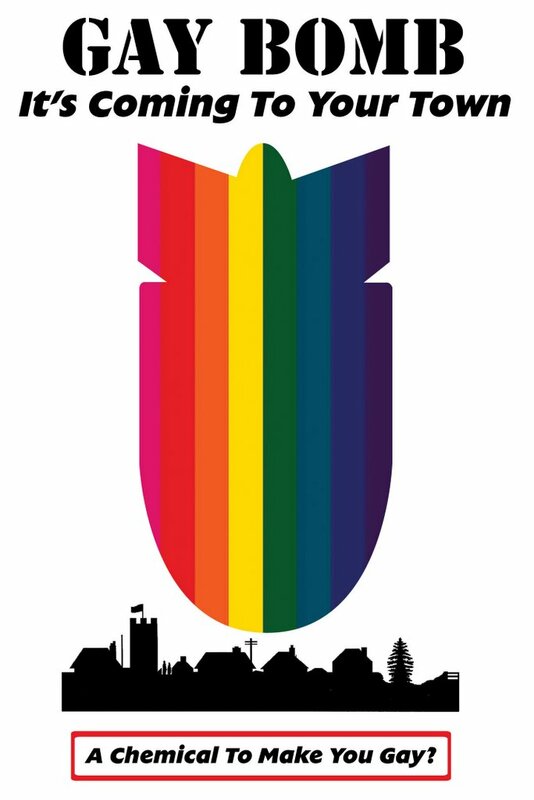 The gay bomb was never actually built but the idea was developed by the United States Air Force in 1994. The proposal was later discovered by the Sunshine Project through a Freedom of Information Act request. I believe Captain Video’s ray gun atomizer should have been #1. The anti-tank dogs of the Red Army frequently looked for food under Red Army tanks as well instead of picking only the German tanks. 9. The Sword Breaker is so scary. There’s another sword breaker, the Chinese sword breaker. The stronghold of Syracuse was Greek not Carthaginian ! Archimedes was Greek !